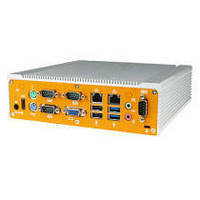 Rugged Mini-ITX PCs meet reliability-critical requirements. Powered by IntelÂ® Bay Trail processor, ML400G-10 features 4 RS-232/422/485 COM ports, VGA, 4 USB,Â 2 LAN, and HDMIÂ ports. Featuring Intel Ivy Bridge Celeron processor, ML400G-11 offers 4 USB, VGA, COM,Â LAN, and HDMI ports. While ML400G-30 includes 4 RS-232/422/485 COM, DisplayPort, 4 USB 3.0,Â 2 LAN, and HDMI interfaces, ML400G-50 is powered by Intel Haswell processors, available with i3 or i5 CPU, and features 3 RS-232/422/485 COM ports, 2 DisplayPorts, 4 USB 3.0, VGA,Â 2 LAN, and HDMI ports. Industrial & embedded PC company launches series of high performance, boldly-styled, rugged Mini-ITX systems for commercial applications where reliability is paramount. South Burlington, VT – Logic Supply (www.logicsupply.com), a leading provider of industrial and embedded computer hardware, has unveiled a new series of rugged PCs which breaks free of the ‘black box’ paradigm in the industrial hardware market. The new ML400 series combines a sleek, exciting aesthetic with ultra-reliable, fanless and ventless engineering to create the company’s smallest full-size Mini-ITX system. The product of years of experience designing rugged, solid state computers, the ML400 series is the next step in the evolution of the Logic Supply product line and a distinct break from the norm in embedded computing. "The ML400 series represents the evolution of not only our own product line, but the embedded industry as a whole," said Logic Supply CEO Roland Groeneveld. "These systems are the brains inside some of today’s most cutting edge technologies, and we believe their capabilities and aesthetics should reflect that. We’ve worked closely with our clients to better understand what they need and want in an embedded PC, and we believe the ML400 series delivers on that research." The models available at launch for the ML400 series offer a versatile range of I/O and processing capabilities. The ML400G-10, aimed at light industrial, workstation, digital signage and industrial control applications features 4 RS-232/422/485 COM ports, VGA, 4 USB including 2 USB 3.0, dual LAN and HDMI and is powered by an Intel Bay Trail processor. The ML400G-11 features connectivity for legacy systems, including an integrated parallel port which is commonly used in both data acquisition and CNC machining applications. Featuring an Intel Ivy Bridge Celeron processor, other standard I/O on the ML420 includes 4 USB, VGA, COM, a LAN port and HDMI. Optimized for low power consumption thanks to its ultra low voltage (ULV) Intel Haswell-ULT processor, the ML400G-30 offers powerful graphics processing at a low thermal design point (TDP). Standard I/O includes 4 RS-232/422/485 COM ports, DisplayPort, 4 USB 3.0, dual LAN and HDMI. The high-performance ML400G-50 features the latest generation Intel Haswell processors and is available with an i3 or i5 CPU. The ML440 is intended for processing intensive applications like digital signage and features 3 RS-232/422/485 COM ports, 2 DisplayPorts, 4 USB 3.0, VGA, dual LAN and HDMI. "The ML400 displays the hallmarks of all of our systems, delivering dependable high-performance computing in a compact, easy to integrate form factor," said Logic Supply Engineer Hans Brakeley. "Other noteworthy features include advanced EMI protection, a specially-selected mix of I/O, and the use of next-generation storage in order to maintain an ultra-compact footprint. The ML400 series exemplifies both our commitment to reliable performance and our desire to continually innovate in the embedded PC design space." The ML400 series is now available through the Logic Supply website at www.logicsupply.com. Click here to view an image gallery of the ML400 Series. The company also offers a suite of OEM services for clients with large-scale commercial projects. Custom versions of the ML400, or any of the company’s other rugged systems, can be easily accommodated. For more information visit www.logicsupply.com or call 802-861-2300. A leading industrial PC company, Logic Supply is powering innovation worldwide. Designing and manufacturing small, rugged computers specifically engineered for harsh environments, the company serves a variety of embedded markets. In addition to its extensive product line, Logic Supply offers custom development for both x86 and ARM-based systems as well as an end-to-end OEM service program. The company has developed a next-generation, fully integrated hardware solution. The result for customers is a true partnership characterized by speed, flexibility and value. Visit the Logic Supply USA website at www.logicsupply.com or EU site at www.logicsupply.eu. A176 GPGPU Computer System is integrated with NVIDIA Jetson TX2 SoM. CPU Board is based on Intel Q35 Express chipset.